Twitter There's not much to tell this month. 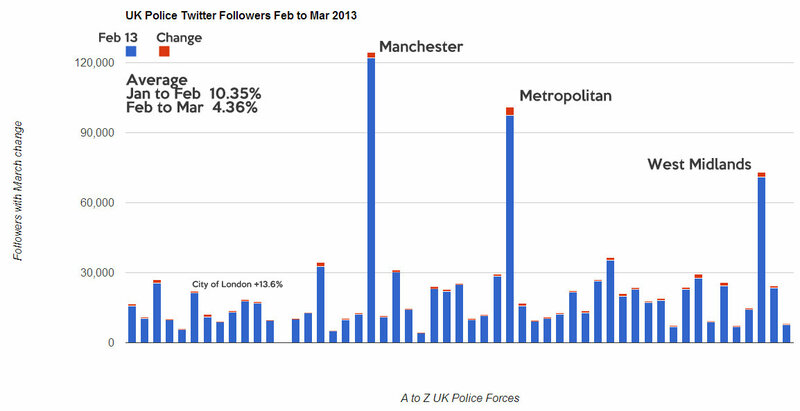 All accounts increased in followers with an average of 4.36% (down from the 10.35% growth last month). City of London, although a small account, grew by 13.6%. 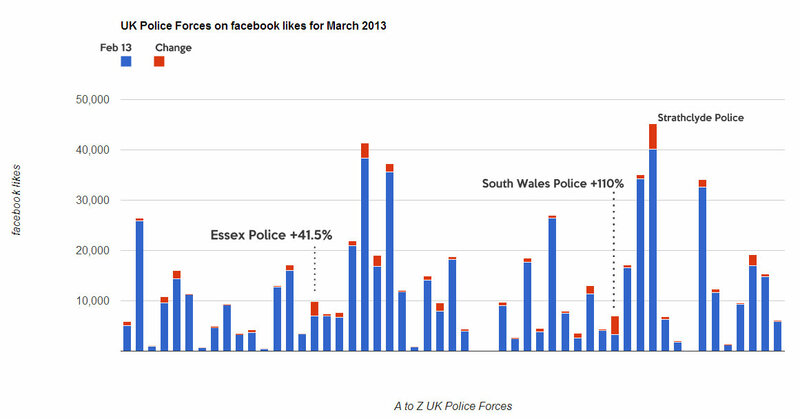 Facebook The two accounts that showed growth were South Wales Police 110% (Red Nose Day Campaign?) and Essex Police 41.5% with Strathclyde gaining a massive 4,967 likes (12.36%). I'm making no secret to keep the last two paragraphs short. You will see why, when onto get onto the use of video and I wish to prevent a watershed. As Police Forces and as people, we are all different, but there are lessons we can all learn. The key in this area is let those who are excelling, to help those who need it. YouTube Accounts at Youtube are starting to look like lap posts spaced out along a road joined by a tiny picket fence. It need not be that way. 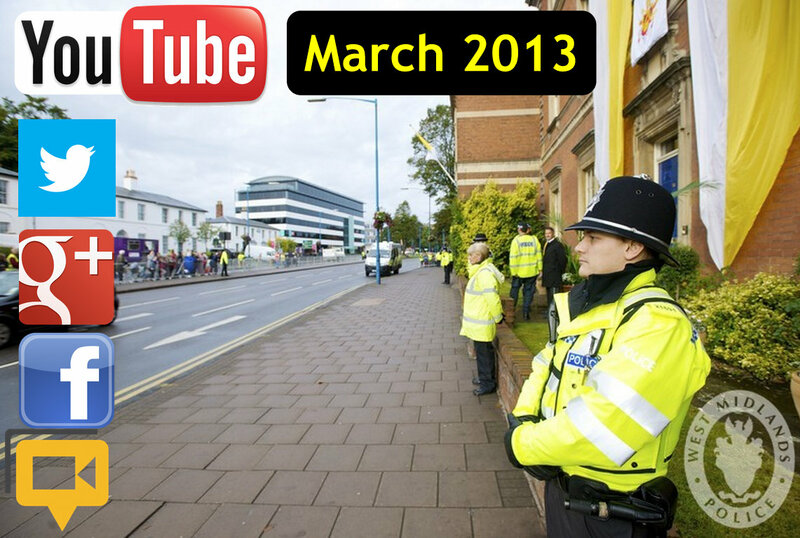 West Midlands Police stands head and shoulders above the rest (this is so important, I will be following this post with a case study about their last month in video). I cannot emphasize enough, the importance of a good YouTube Channel and timely uploads. Video, especially on second screens (like a mobile, tablet or laptop) is growing at a meteoric rate. West Midlands are getting 300 to 600 subscribers a month. 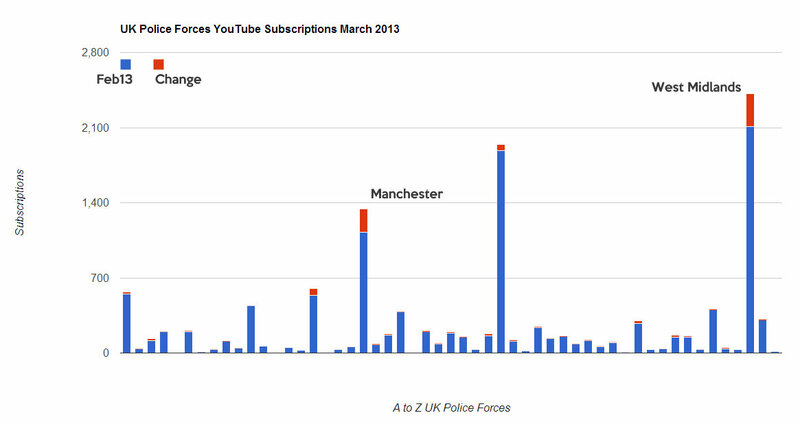 In my view every Police Force should be getting at least 2,000 subs a month. All you have to do is ask for people to subscribe and tell them why it's essential (I will cover that in the next post). YouTube have added a brilliant new clean design called One Channel. It's only been available since 8 March. I'm delighted to see four forces already using it: North Yorkshire, Staffordshire, Surrey and West Yorkshire. 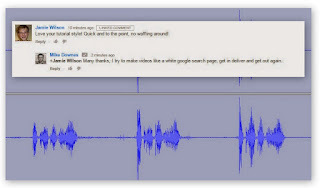 YouTube Uploads This is the most powerful, yet neglected area of Social Media. I survey 49 force YouTube channels. Twenty seven forces added no videos this month. This includes four forces who actually deleted videos. There are three reasons I write about the use of media. I'm passionate, I like helping people and I want to know what's round the corner. To do that I have to be Curious, Creative and Consistent (ask questions, make stuff and keep doing it). 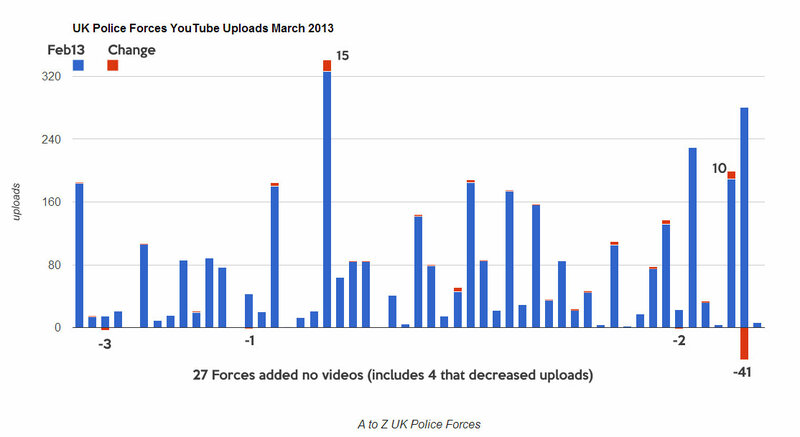 Looking at the chart for YouTube Uploads, I can see one or two super channels developing and many others that will let their channel sit there gathering dust. YouTube views are in the billions. Every adult and (child for that matter) has a smartphone. Video is everywhere. What I suggest, a structured plan to make sense of video for all police forces (I also have a few posts coming for Police Crime and Commissioners too (they are elected until 2016, so better get cracking with video. I know a few who already have). Thanks for keeping this data. Out is building into a really interesting data set. With regards to videos being deleted, I can't comment for these cases (I don't think I work for one of the forces that had deleted a video) but there is at least one very good legal reason I can see for deletion. If a police force puts out a video of CCTV to try and identify a suspect or witness, that video could be prejudicial when the case subsequently comes to court. For this reason, video (and CCTV stills too) should be deleted as soon as the individual is identified. Of course the internet being what it is, those images may still be in circulation, but at least any images are no longer being published by the investigating force. I agree with your view and comments. I try not to get involved in Police policy, but rather view everything as an 'intelligent' person in the street. I'm looking at the media theory. Sergey Brin invented Gmail, there was no button to delete anything. I remember somewhere, how he said, there is no need to delete. Users went crazy as they felt emotionally unattached to some messages, and just needed a peace of mind to have some message gone forever. This maybe the case here, where some people, may have a clean out and delete the old stuff. Others, like me, may view it as public, open transparent where 'everything' stays online unless there is good reason to pull it down. Machines only go so far until people's perception takes over.